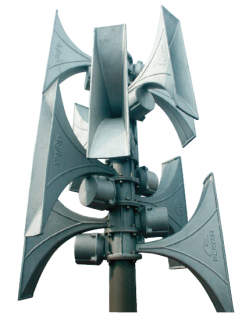 The Digitex DSE Electronic warning system is a completely modular array of high output sirens that can be configured for and are compatible with virtually any signalling application. Thanks to its modular structure the DSE Electronic Siren can be easily be expanded by use of additional elements, such as amplifiers and loudspeakers, thus enhancing its acoustic power and sound intensity. 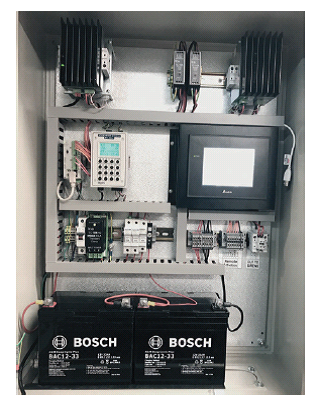 Each electronic siren tower configuration is composed of a number of slotted sirens depending on the siren’s power (ranging from 300 W to 3000 W) and comes with a control cabinet containing a control module and signal generator, WSE-300 amplifier modules, ZSE-24 amplifier module, two maintenance-free batteries having a capacity from 33 Ah up to 120 Ah, and other actual warning system adapters, all of which come enclosed in a metal cabinet. DSE sirens are adapted to cooperate with any warning system, and can be controlled via analog VHF/UHF radio networks, digital radio networks of DMR (TDMA) and NXDN (FDMA) standards, and IP networks (LAN/WAN, VPN). They can also be adapted to wireless-operated systems based on GSM, GPRS, 3G, CDMA, WiMax, and LTE technologies as well as with systems which use conventional PSTN lines or leased lines. In addition DSE can broadcast any sound messages saved in the system memory as wave or mp3 files and allow for real-time transmission of voice messages, either from a remote (control station) or a local site (microphone installed on the control cabinet) site. DSE sirens co-operate with external systems, such as: weather stations, chemical, biological, and radioactive contamination sensors, water-level gauges, as well as control elements of road traffic signaling systems, gate opening systems, etc. 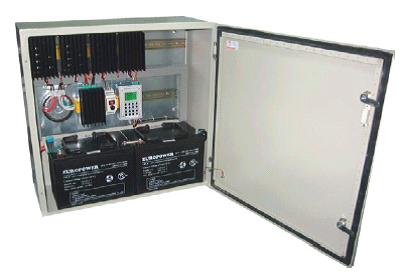 Power supply may originate from the mains (230 V/50 Hz) or via solar panels. Cable Set For Mast & Pole. – High output electronic warning system. – Stores and reproduces customized tones and voice messages. – Sound output up to 123dB @ 30m. – Sound Frequency: Up to 64 alarm tones, up to 64 voice messages (max 8 min), real time voice messages (via optional mic or form control center via IP or radio). – Supply Voltage: 240VAC (others on request). – Max Current: <3A during charging. – Power Consumption: <6W in standby mode (without additional accessories). – Autonomy: Standby – up to 30 days in standby mode, Alarm – up to 20 x 1m alarms. – Battery backup built in. – Batteries: 2 x 12V SLA (33Ah to 65Ah depending on siren power). – Advanced control and diagnostics. 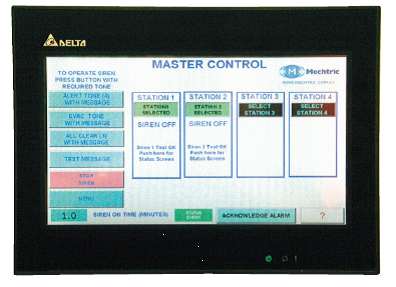 – Control: Standard – 7 x digital inputs for tone/voice message selection RS-232/RS-485, local HMI for diagnostics and alarms; Option – remote activation by hard wired push buttons or HMI wireless activation by radio modem, GSM or SMS activation and live voice messages by VHF/UHF. – Software available for control of multiple sirens via IP or radio network at local or regional level. – Upgradeable for future expansion. – Temp Rating: -20 to +60 (not in direct sun) degrees Celsius. – Rating: Maximum 30min alarm. – Cable Entry: Through cable gland plate. – Construction: Aluminium alloy horns, powder coated steel control box (optional 316 stainless steel). – Dimensions: Control Cabinet – 800w x 1000h x 300d, Loudspeaker Horns – 610w x 600h x 140d. – Weight: Control Box – up to 85kg depending on configuration, Horns – 9kg each. – Minimum recommended loudspeaker pole height is 6m. DSE-300S Digitex DSE 300W, 103dB (A) @ 30m, 2 horns, 1 x 300W amplifier, 2 x 12V 33Ah batteries. DSE0600S Digitex DSE 600W, 109dB (A) @ 30m, 4 horns, 2 x 300W amplifier, 2 x 12V 33Ah batteries. DSE-900S Digitex DSE 900W, 112dB (A) @ 30m, 6 horns, 3 x 300W amplifier, 2 x 12V 44Ah batteries. DSE-1200S Digitex DSE 1200W, 115dB (A) @ 30m, 8 horns, 4 x 300W amplifier, 2 x 65Ah batteries. DSE-1800S Digitex DSE 1800W, 118dB (A) @ 30m, 12 horns, 6 x 300W amplifier, 2 x 65Ah batteries. DSE-2400S Digitex DSE 2400W, 121dB (A) @ 30m, 16 horns, 8 x 300W amplifier, 2 x 80Ah batteries. DSE-3000S Digitex DSE 3000W, 123dB (A) @ 30m, 20 horns, 10 x 300W amplifier, 2 x 80Ah batteries.